Brazil Nut Tree - ARTE AMAZONIA provides a global voice through art for the indigenous cultures of the Amazon. 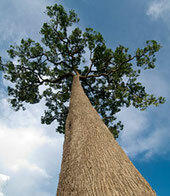 Famous for reaching heights of over 160 feet, the Brazil nut tree towers above other trees in the Amazon rainforest. During January and February, its fruit -- which is the size of a baseball and can weigh up to 5 pounds -- ripens and falls to the ground, reaching speeds of up to 50 mph on its descent. Inside the fruits’ hard, woody exterior are anywhere from 10 to 21 nuts arranged in a pattern similar to segments of an orange. The outer casing of the fruit is so hard that only one known animal -- the agoutis, a large rodent with sharp, chisel-like teeth -- can crack it open. Local artisians have discovered that the shell also makes a unique sound and have use it to create an instrument. The design is textured and elegant with a long smooth handle which adds contour and line to the form. The rustic but sophisticate design of the instrument makes it a conversation piece, as an ideal example of rainforest beauty and the need to maintain forest and avoid deforestation. 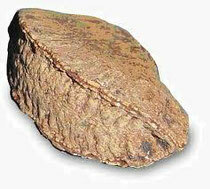 In just one year, a Brazil nut tree can produce some 250 pounds of nuts. By utilizing the natural beauty found in the rainforest and availabilty of natural resources there are more and more reasons to preserve these trees than distroy them. The Brazil nut tree is predominantly found in the Amazon rainforest of Brazil, although it can also be spotted in Colombia, Venezuela, Ecuador and Peru. The tree grows best in non-flooding areas of the moist lowland rainforest and is often found within a group of 50 or more similar trees (groupings like this are called “stands”). Brazil nut trees are sensitive to deforestation, and only seem to produce fruit in undisturbed forest. They depend on agoutis for seed dispersal, bees for pollination and other plants in the rainforest for their continued survival. If these other species disappear, so will the Brazil nut tree. Brazil nuts are one of the most valuable non-timber products found in the Amazon, usually harvested from the wild by local people. They are used as a protein-rich food source, and their extracted oils are a popular ingredient in many natural beauty products. The collection and sale of Brazil nuts and their offshoots also provides an important source of income for many forest-based communities. Through projects like the Initiative for Conservation of the Andean Amazon, the Rainforest Alliance works with local communities to diversify their sources of income with non-timber forest products, like the Brazil nut. If properly managed, non-timber forest products provide income for communities living in and around tropical forests. In addition, they provide these communities with an economic incentive to conserve existing forest and reforest degraded forests. Jukofsky, Diane. Encyclopedia of Rainforests. Connecticut: Oryx Press, 2002. 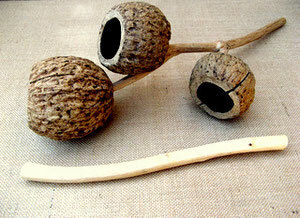 Brazil nut instrument can be found at The Urban Shaman Collection at www.arte-amazonia.com. Short documentery by Green Living Project (GLP) promoting ACCA, a non-profit organization located in Peru, working with sustainable harvesting of Brazil Nuts.